Mother’s Day is approaching fast! Do you have your gift yet? Here are a few fun mother’s day gift ideas that you can order today and receive them in 1 or 2 days! Who doesn’t love a yummy healthy basket filled with snacks? I promise this will put a smile on mom’s face. This basket is loaded with goodies – and no guilt. Or choose another from Gourmet Gift Baskets because they have MANY! The fun is in the unpacking! Fresh Orchard Fruits – An assortment of incredibly fresh fruit delivered straight from the orchard. Sea Salt & Cracked Pepper Kettlecorn by KingOfPOP.com – Delectable gourmet popcorn sprinkled with sea salt and cracked pepper to create the perfect popcorn flavor. Deli Style Hors D’Oeuvre Crackers by Partners – Made with the finest all-natural ingredients like olive oil and sea salt, these thick, artisan crackers are as delicious on their own as they are paired with your favorite jam or cheese. Wild Maine Blueberry Preserves by Clearbrook Farms – A great addition to your blueberry muffin recipe, these blueberry preserves are fresh, sweet and flavorful. Blueberry Pomegranate Clusters by 180 Snacks – This tasty snack is packed with cashews, pumpkin seeds, sunflower seeds, almonds, and flax seeds, clustered together with crispy rice, fresh blueberries, cranberries, and pomegranates. Raspberry Honey Mustard Pretzel Dip by Robert Rothschild Farms – The perfect addition to any salty snack, this dip is both tangy and sweet. Pretzel Twists by Auntie Trudie’s – crunchy pretzel twists are lightly salted after being baked until golden and crispy. Pineapple, Coconut & Macadamia Orchard Bar by Liberty Orchards – A yummy snack bar featuring the flavors of juicy pineapple, sweet coconut, and buttery macadamias. Roasted & Salted Peanuts by J&R Gourmet – Classic Virginia peanuts, dipped in oil, sprinkled with fresh salt, and gently roasted. Sugar River Trail Mix by Merrimack Valley Snack Company – A satisfying snack mix with all the tastiest treats in every handful, like sweet dried strawberries and crunchy honey sesame sticks. Blueberry, Pomegranate & Almond Orchard Bar by Liberty Orchards – A yummy blend of tasty mountain blueberries, juicy pomegranates, and crunchy almonds. Help mom relax with coloring books! I have really enjoyed giving them out for gifts to a lot of different people. Here are a couple of brand new released ones for you. I haven’t received my copies yet, but when I do I will update with inside photos for you to see closer. 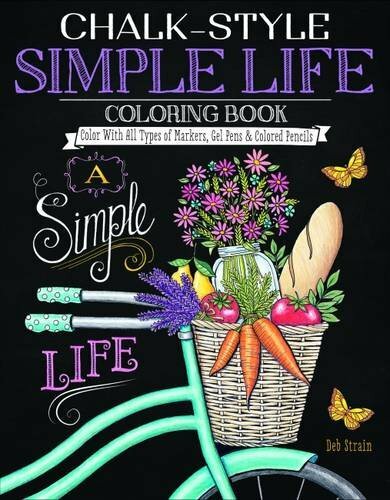 Chalk-Style Simple Life Coloring Book – sounds super cute! Hand-drawn designs that celebrate the community spirit of farmers markets with all of the charming imperfections of original chalkboard art. From seasonal veggies and artisanal bread to organic milk and just-picked flowers, these folksy market stands are overflowing with natural delights. Each exquisite white line illustration is presented on a black background, just like a real chalkboard. Each design is printed on one side only of archival-grade, acid-free, 200-year paper, and perforated pages detach easily for gifting or display. This book has earned the DO Magazine Artist Fair Trade Seal of Approval. Hello Angel Coloring Book Gift Set – 2 coloring books, color pencils, sharpener and a guide in a pretty box! 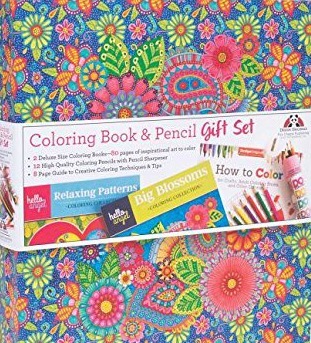 Hello Angel Relaxing Patterns & Big Blossoms Coloring Collections – Escape to a world of abstract art, motivating messages, and pretty patterns, all waiting to be filled with every color of the rainbow. Relax and unwind as you color these luxuriant images from breakthrough coloring artist Angel Van Dam. How Mother’s Day Gift Ideas do you have? 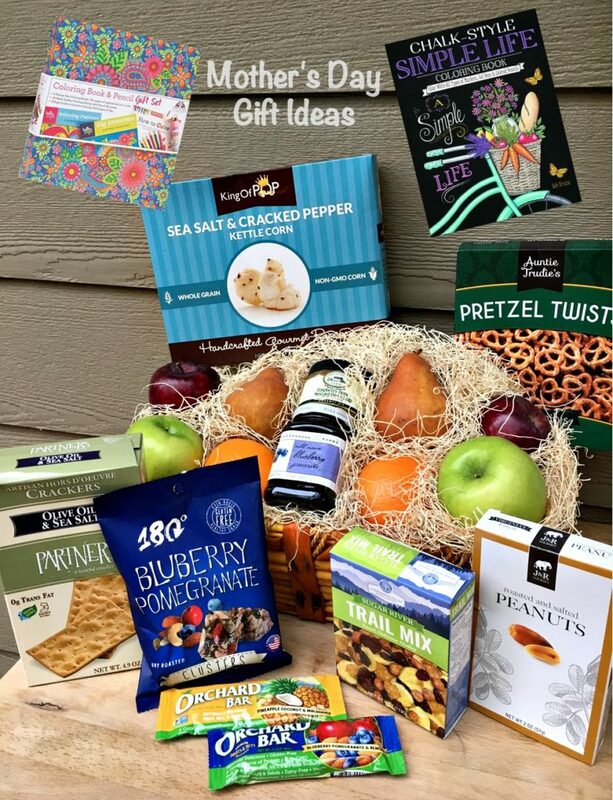 I partnered with Gourmet Gift Baskets and Fox Chapel Publishing for this Mother’s Day Gift Ideas post and received free products. All opinions my own. Links may be affiliate. This giveaway will end on May 16, 2017 at midnight MST. Winners will be drawn via rafflecopter. Once a winner is drawn I will contact them and they will have 48 hours to reply before I draw a new winner. Giveaway is open to anyone in the US. You must be 18 years of age or older. Giveaway is not affiliated with Facebook & I release them of liability. Winner will be posted in the rafflecopter widget. Summer Starbucks Giveaway ~ 2 Winners! My meat slicer broke and since we use it all the time, I asked for a new one and I know that I received it. Carving and cutting meat, etc, is so exhausting and at times, painful for me, so I was so excited to know that this wish list item was answered! We'll be getting some flowers and chocolates. Books and dinner out always makes for a nice Mother's Day! I bought a couple charming picture books for the day. I would love a new coffee maker or some new mixing bowls. My sister and I are taking my mom on a girl's day this year. We are taking her to lunch and then to the spa and shopping. It will be cards and a phone call. I will be getting my Mom some flowers. We'll be taking my Mother-in-Law out for brunch, plus we have a special gift basket for her. I will take my mom out for lunch and go shopping with her at one of her favorite shops. We will be having a seafood cook out at our house for my mother, myself, and my step daughter, and my 2 daughter in laws for mother's day. We all pitch in and do a big nice splurge versus a bunch of different stuff for each other. 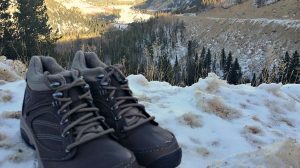 This giveaway is full of great gift ideas. I just ask for canned cat food for my shelter cats. my mothers day gift idea is to make my mom hr faves and spend time with her. I always have a hard time figuring out what to get my mom. A gift basket is actually a good idea. I usually also cut her some flowers from my garden. Hubby prepares a lunch of crab legs and steak for our family, including my mom. I like giving and getting flowers to replant. I'm planning to have brunch with my daughter and granddaughter. I am planning to send my mom a bouquet with butterflies somehow worked into it. This is her first Mother's Day without her mom and my Nana loved butterflies. I don't have one yet! I usually come up with one last minute. My idea is take mom out to dinner for Mothers Day. We will be having Mother's Day lunch at my grandma's house to celebrate this year. I usually took my Mom out for a pamper me day of going to the spa and getting her hair done. If a miracle happens, I'll be giving my mother the best mother's day present ever - a due date for a grandchild. I'll probably get my mom a gift certificate to a restaurant. She likes to go out to dinner. I love to cook and make dinner for the mothers in my life! I'm planning to take my mom to a play. I usually treat my mother to a dinner and a movie of her choice. I would love to just be able to spend the day with my mom. I don't get to see her very much so I reall miss her. Buying my dear mother a vanilla orchid for her tropical garden in Hawaii. This year I plan on getting my mom a variety of flowers for her garden. I think this will make the perfect Mother's Day gift. Not sure. Hopefully my daughter will come up with something otherwise I'll be playing with my flowers in the garden. A nice home cooked dinner and time with family. My mom lives out of town so I send her a card and plan for a good chat over the phone. We are celebrating Mother's Day with my mom all weekend. I always spend the day with my mom and we do whatever. The last few years she has had some health issues and recently had heart surgery and we almost lost her so I'm thankful to be able to celebrate another Mother's Day with her.☺ Happy Mother's Day to all you amazing mom's! I will get my mom a book of her choosing(she loves to read)some Chinese food,some chocolates,and some comfortable pajamas and slippers and she will be happy. My Mother's Day idea this year is a basket full of things my mom loves and some things that I love that I think she might too. My mom is gone now, but I used to get her a beautiful hanging basket every year. Brunch and flowers is always nice. This is a great assortment anyone would love! Since I lost my mom in 2014, I always try to make her favorite things fro my hubby and I to enjoy and we remember good things about her life. She is remembered and thought of daily but this is her day. I think a fruit basket is a great idea. I am giving my mom a really nice bathrobe. I would love brunch and a spa day! We will be going out for a brunch, and we will visit our local arts and crafts show this year. I don't my mom to celebrate with any more. We usually put the vegetable garden in on that day...as my present to me. I'll be giving my mom framed pictures of her grandchildren! I am giving my mom a jewelry box that I know she would love ! I am going to detail my mom's car. My mom passed away a few years ago. Miss her terribly. I am going to get my daughter and daughter in law a mother's day gift but not sure what yet. It would be really nice to just have a quiet Mother's Day lunch with daughter & granddaughter instead of being in a large group. I just want to have take out dinner at home. Happy Mothers Day to all of the Mothers. I will actually send my Mom a card this year! For many years I have been on the other side of the globe at Mothers Day and this year I am not and can actually send one knowing it will arrive on time! I am getting my mom quilt supplies. Yum! I love baskets full of treats - and those coloring books look amazing! I have never seen the chalkboard style books - very cool! I would like to have lunch with my Mom and my two daughters for Mother's Day. My gift would be sleep! I am soooo tired. Taking her to lunch only this year. My mothers day gift idea this year will be flowers! I really would love anything...especially chocolates! My mothers day gift idea this year will be flowers and chocolates. I'm not sure-my Mother's Day gift will probably be dinner of some sort. I am sending my mom a bouquet of tulips this year. Giving candles for mother's day. My husbands and my mom have past but we will be giving our daughter who is an amazing mother to her two sons some nice kitchen gifts, thanks! My mother is a big reader...she loves her romances. So, I have been collecting romance books for her all year...and she will get a big beach bag full of books! I am sending my mom some flowers. Wishing I could be with her. My husband is cooking dinner for his mother. We are getting her a gift of all of us from shutterfly and some orchids and cooking breakfast. My mother needs a new mattress.That is what my Mother's Day gift is. I'm doing a spa day for my mom! High tea at the botanic gardens. Thanks for the contest. I am giving my mom movie theater tickets. What I want for Mother's Day is spend time with my kids and grandkids. Maybe have a picnic. I would just like to be with my kids and grandkids. Maybe have a nice dinner together. 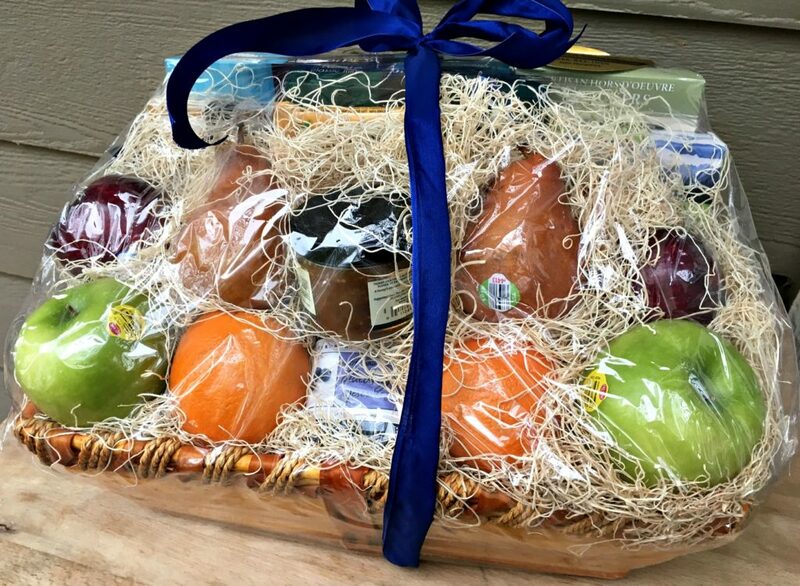 This gift basket is filled with healthy food choices and looks like a great gift not only for Mother's Day but for any occasion. Mother's Day for me is usually a nice brunch with my husband, daughter, son-in-law and granddaughter...perfect! My Mother's Day Gift idea this year is a do absolutely nothing day. I just want to have a quality day with my sweet as sugar Chloe Pearl! We usually go out for a Polish buffet on Mother's Day. Yummy in my tummy! What a great basket this would be perfect for my mom. My idea this year was a photo blanket of all the grandkids! a beach walk and seaside picnic with friends and family! My gift idea was a basket of cookies. I'm getting my mom some pictures and picture frames of me and my brother with her. My ideal Mother's Day is to do nothing at all and have some alone time! I am a stay at home mom of three so I am never alone and constantly doing something. I often ask for things to add to my bird feeding system outside as well as bird food for Mother's Day. That is what I did again this year. A trip to her favorite places. Thanks for the contest. I got a new telephone for Mother's Day. Everything in this basket looks so good. I guess it's a question of what to dive into first! :) I'll be going out to diner tonite with the kids. My Mother's Day gift idea is flowers. My idea was a gift card to the spa for my mother. A relaxing evening with delicious food. I took my mother and mother in law out for dinner this year, but I wish I'd done more. Thanks! A gift basket would be a perfect Mothers Day Gift. This basket would have been perfect! We went to my parents for brunch, which was my idea! Flowers, Gift Cards, or a gift basket of beauty products is always nice. Locket with great grandkids pics!! Brunch and special trip to the jewelry store together to get the perfect gift was my gift! I enjoy getting new plants for my garden, they make me happy. I gave my mom scratch tickets- she loves them. My Mother's Day Gift Idea this year was a family tree necklace with all the children's birthstones on it. Was thinking of an Amazon Echo, but maybe not. Maybe a really cute bird feeder or bird bath. I would like a nice family dinner. Mine was to have a calm quiet day with the family and a little time to myself. It is over now, but happy summertime! I would like to thank you for your involvement in this fine giveaway. Thank you for giving us all the chance. My idea of a gift for myself is to have my daughter come visit and spend the day. We get along great and I love listening to her tell me about what's going on in her life.